Games with friends aren’t about the competition. They are a catalyst to deepen those ties. And as long as you and your friends can speak English, addictive word games Challenge Your Word Skills With These Addictive iOS Games Challenge Your Word Skills With These Addictive iOS Games Playing word games can often be a lot of fun, but also have the added bonus of being educational, keeping your mind sharp and improving your vocabulary. Taking these kinds of games with you on... Read More serve as a lovely way to build bonds while having fun. Given that you can now play most games on your phone or tablet, it’s even easier to keep in touch and play a game when you aren’t around each other. But that infernal wall between Android and iOS often plays spoilsport. Where’s Letterpress Letterpress - An Addictive New Word Game You Won't Want To Put Down [iOS] Letterpress - An Addictive New Word Game You Won't Want To Put Down [iOS] Letterpress is a brand new word game that comes to us courtesy of Tweetie creator Atebits. Available as an iOS app, the new word game will likely have you glued to your iPhone screens. Deceptively... Read More for Android to play with my Apple-hating friend? And how do I compete in a game of Word Weasel on my iPad? They are asynchronous multiplayer games, so that means you play a turn and wait for your friend to play theirs, at a convenient time. Apart from creating in-game accounts, they all let you hook up your Facebook account and find your friends. They are all free, although you can buy paid versions to remove ads or add features. They are incredibly addictive and you will end up wasting a lot of time on them, possibly also giving your friends the choicest of expletives in the process. Ruzzle takes the timeless game of Boggle and gives it a digital twist. For those unfamiliar with Boggle, you get a 4×4 grid of letters, each worth a few points. Going horizontally, vertically or diagonally, you have to make words by connecting the letters, but no tile can be used twice in the same word. With a time limit of 2 minutes, you have to make as many words as possible. Ruzzle amps it up by introducing Scrabble-like 2xLetter, 3xLetter, 2xWord and 3xWord tiles, which give you more points when used. It’s a 2-player asynchronous game, in which a match has three rounds, with a new grid in each. Adding up your total points at the end of the three rounds decides the winner — so just in case you did badly in one round, you can still catch up! There’s another similar game, Scramble With Friends Beat Your Friends at Their Own Word Game in Scramble With Friends Beat Your Friends at Their Own Word Game in Scramble With Friends It need not always be about sharpening your vocabulary; though that helps. Word games can be just fun. And when you introduce competitive game play against others in the digital Wild West of the web,... Read More , but Ruzzle has the better interface and keeps it simpler, while Scramble introduces elements like power-ups. Download Ruzzle from the App Store or the Play Store. If you had a blast playing Scrabble with your friends at a party, then take it to your mobile with Words With Friends, a turn-by-turn digital incarnation of the classic game. 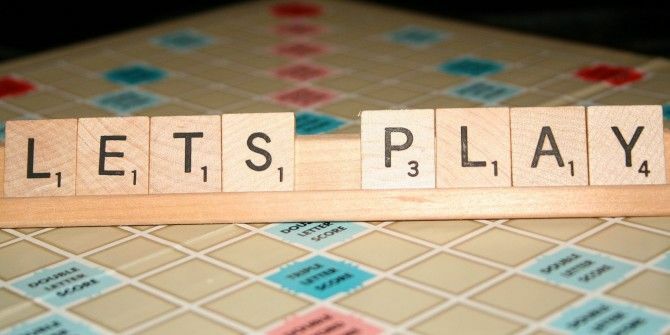 Zynga’s version sticks to the basics of the original Scrabble, but introduce a few changes. First, it’s a one-on-one game and you don’t get to play with four friends at a time. Second, the grid of the board has changed slightly, but it still holds the usual squares like 2xLetter, 3xLetter, 2xWord and 3xWord. In each round, you will have a total of seven tiles, with each letter worth certain points. Make the best word possible given the existing board and win. You can buy power-ups like the Vision tile to get hints on the words you can make. And weekly Leaderboard competitions give general challenges to let you compete against all your friends and see who’s the best. One word of advice? If you like this game, buy the $1.99 ‘No ads’ upgrade — the ads are very annoying, not to mention being data and battery hogs. Download Words With Friends from the App Store or the Play Store. It’s a pity that Letterpress isn’t on Android because it’s one of the most addictive word games on iOS Letterpress - An Addictive New Word Game You Won't Want To Put Down [iOS] Letterpress - An Addictive New Word Game You Won't Want To Put Down [iOS] Letterpress is a brand new word game that comes to us courtesy of Tweetie creator Atebits. Available as an iOS app, the new word game will likely have you glued to your iPhone screens. Deceptively... Read More . However, there is a clone that works on both platforms. Meet Wordly. It’s a shameless ripoff, but it does try to introduce at least one new element. The premise of the game is just like Letterpress. In a 5×5 grid of letters, you are Blue and your opponent is Red. Use any letters to make a word, and they turn into your colour. If your opponent uses the same tiles, they become his colour. To ‘capture’ a tile so that it doesn’t change colour when your opponent uses it, you have to own all of its surrounding tiles too. When all the tiles are used, the game ends and whoever owns more tiles is the winner. The only difference from Letterpress is the introduction of ‘Wild Tiles’, which are non-grid tiles that you can use to form words, although they don’t count towards the number of tiles you own. If you are playing any of these games and want to ensure your friends aren’t cheating 3 Online Tools To Defend Yourself Against Cheaters At Word Games 3 Online Tools To Defend Yourself Against Cheaters At Word Games Don't you just hate it when you're in the middle of a great Words With Friends game and someone manages to luck out with a word like "atropine"? Maybe it's only frustrating when the rest... Read More to get ahead, there are a few ways you can find out. And if you don’t like word games, there are other asynchronous multiplayer games Love Asynchronous Multiplayer But Hate Word Games? You'll Love These [iOS] Love Asynchronous Multiplayer But Hate Word Games? You'll Love These [iOS] It all really blew up with the popularity of Words With Friends, and since then a huge number of games have been released to take advantage of the "with friends" turn-based multiplayer system. Some have... Read More you can play with friends. So tell us, what are your favourite cross platform word games to play with pals? Are there any single-player titles you like and wish there was multiplayer to challenge your buddies?